BELE,opens application period for 2017-18. Application period goes from 24th of april to 6th of June, both included. 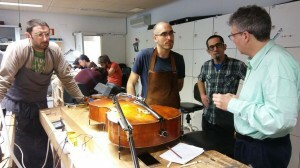 The course is divided in three years and based on five main subjects, Building the instruments of the string quartet, Restoration and repair techniques , Bow maintenance and repair, Acoustics and Work and business studies. Our studies include work practices in workshops of different luthiers and possibility to apply to the European Erasmus + grant program.